The other day Michelle from Organic Girl stopped by our gym with a big box full of goodies! 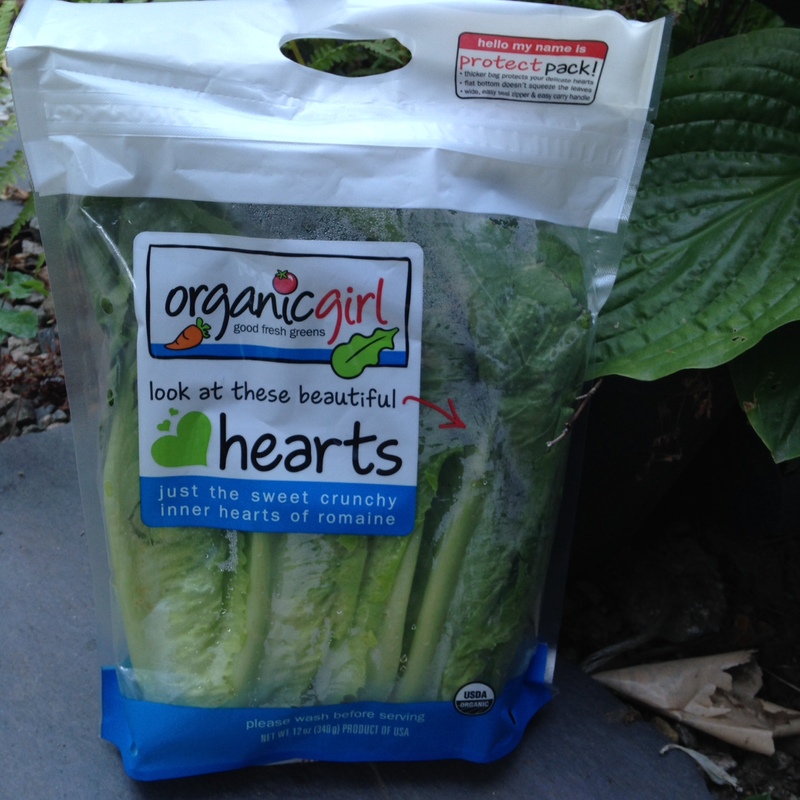 So as a thank you, I decide to create a recipe using these organic romaine hearts. Honestly I could just eat them straight from the bag, they are so sweet and fresh with a perfect crunch! However I wanted to try something new. Nik and I have recently talked about our challenge with digesting big amounts of fresh veggies. I really enjoy salads however sometimes my body is just not having it. Especially as my evening meal I tent to do better with cooked veggies. Cooking vegetables makes them easier to digest. Some people have a hard time breaking down raw vegetables in their gastrointestinal tract. Lightly cooking vegetables helps to break down the plants’ cell walls, making them easier to digest. If cooking your vegetables makes them easier for you to consume — by all means, cook away. With that said, let’s explore some new ways to eat your salad, shell we? …sounds bit crazy? Well just try it and then tell me what you think. 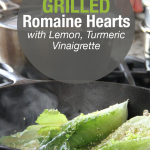 Romaine lettuce has natural sugars inside that are released during the grilling. Combine that with something so simple as lemon, turmeric vinaigrette dressing and we have a winner! I topped it up some hemp hearts however roasted pumpkin seeds or sunflower seeds would also be a nice choice. We served ours with baked sweet potatoes and scrambled tempeh, which made it a perfect summer meal! I hope you decide to give this spin on a salad a try! 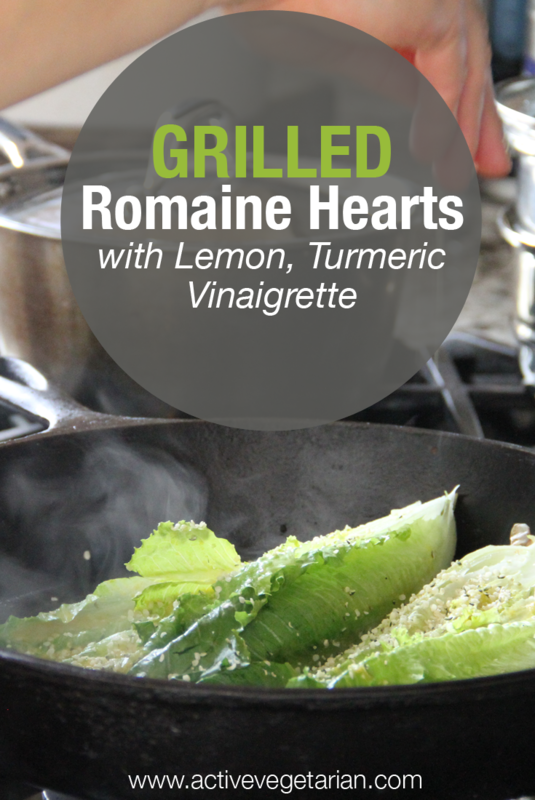 Squeeze the lemon juice into a bowl, and add the Dijon mustard and turmeric powder. Using a whisk or fork, mix ingredients together until well combined. Rinse the heads of lettuce under cold water. Now place the Romaine heads on a cutting board and pat dry with a paper towel. Then cut the heads of Romaine in half lengthwise. Drizzle the olive oil over the half heads of lettuce. Build a medium-hot fire in a charcoal grill, or heat a gas grill to medium-high. (Alternatively, heat a cast-iron grill pan over medium-high heat.) 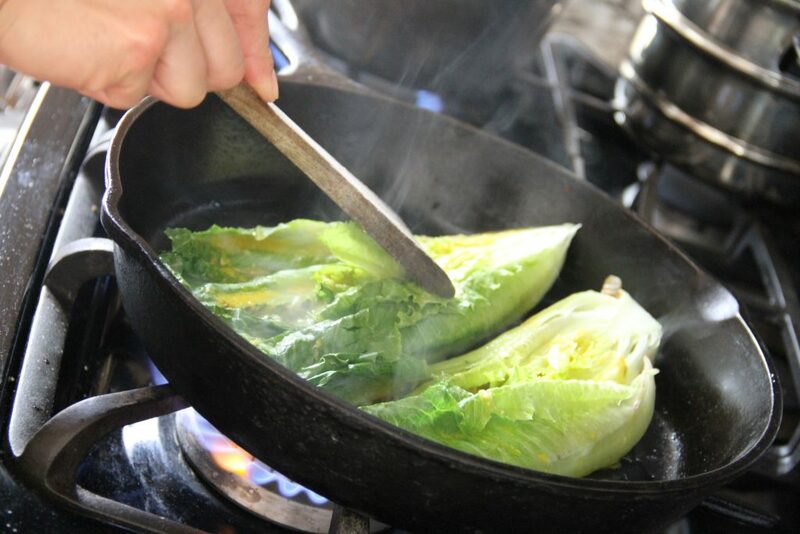 Working in batches, if necessary, place romaine halves cut-side down on grill, and cook, turning once, until charred and slightly wilted, about 3-4 minutes. Transfer lettuce cut-side up to a serving platter, and season with salt and pepper; drizzle with lemon/turmeric dressing, and sprinkle with topping of your choice. Grilling takes only a couple of minutes so keep checking the underside. Look for the lettuce to blacken a bit. A nice char is the desired result without having the lettuce wilt too much under the heat. GOOD VIBRATIONS JUICE FOR WEIGHT LOSS, ENERGY AND DETOX!